Here are my three blocks for this months lotto. I actually made 6 but cut the other three down to 6 inches unfinished before I realized duh….should have been 6.5. Oh well that is what I get for hurrying and trying to do these things at the last possible minute. Sophie, I love this months colors, sure hope it’s finally my turn to win. 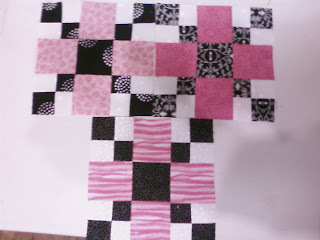 Shelli, your blocks look great! Good luck to you (and everyone). Since Michelle (mom of 11) was too much of a moving target to make any blocks this month, she’ll be randomly picking our winners when I send her the list. I just received email from a newbie, so I think we have a few more blocks coming before the deadline in 30 minutes . . .